I’ve lost track of the number of times I’ve visited Bali. Visiting for the first time as a teenager accompanied by my parents, Bali was the destination for my first overseas trip in the late 1970’s. Four passports later the island still lures me back despite the good the bad and the absolutely ugly terrorism that saw visitors stay away for a few years. Bali however has bounced back and is once again a favoured destination for Australians, myself included. There is something intrinsically attractive about Balinese people and their manner. Humble yet gracious, charming with a subtle humour, devoted to their gods, the Balinese sense of community and family creates an alluring charm for the visitor. Indeed, with tourism the main industry on Bali, it’s hard to imagine another destination that is so attuned to just what visitors want. 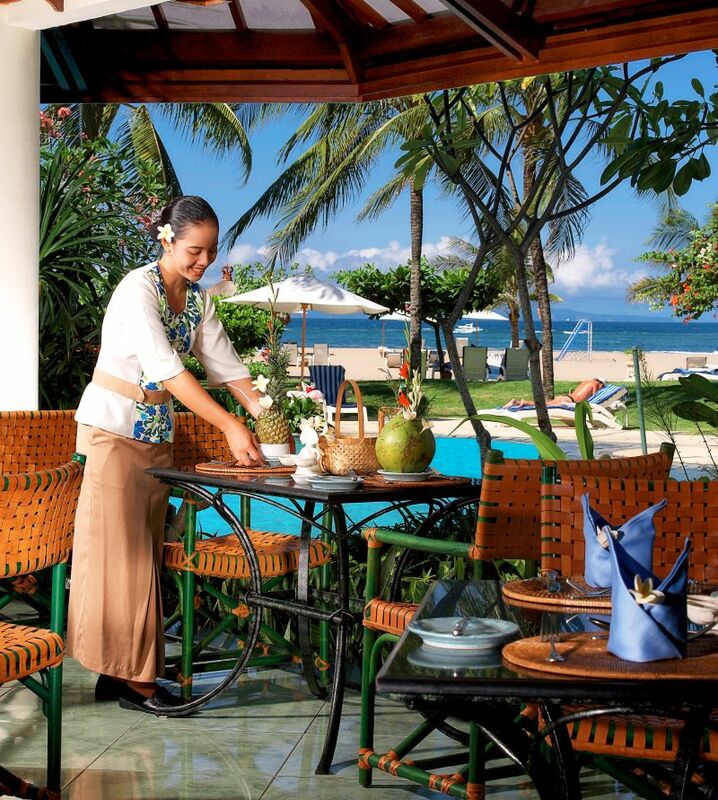 Grand Mirage Resort on the beach at Nusa Dua has their finger firmly on the pulse. An all-inclusive resort, packages include either bed and breakfast or full board with all meals included. For families or groups traveling together it’s particularly enticing, taking the pain out of having to choose where to eat each night. 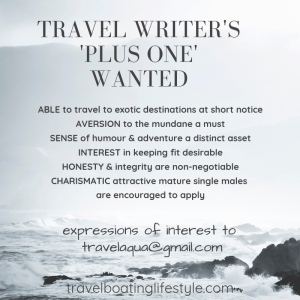 Though if you’d prefer to eat out or try a different Balinese restaurant (or the plethora of international style restaurants) each day there is the option for room only. Built in 1993 when Nusa Dua was ‘the’ place to be seen in Bali, guest rooms and the lobby underwent a refurbishment in 2011. Lush landscaped gardens, lagoon style swimming pool, sun lounges and shady thatched roof cabanas sit on five hectares of land between the resort building and a private east facing white sand beach. Deluxe Garden View or Deluxe Ocean View rooms are large enough to include a sitting area as well as twin or king beds, are decorated in understated style with timber floors and come with a small balcony (or patio on the ground floor with direct garden access). Bathrooms have moveable louvre shutters that allow plenty of natural light and circulation, with bathtub and separate shower. Spacious Suites and Family rooms are also available. Hotel facilities are extensive. All the usual toys are on offer at the water sport centre plus there’s a tennis court, games lounge with pool table, table tenis area, kids club, beach volleyball, swimming pool with waterfall (with aquarobic classes) business centre, wedding chapel, a couple of restaurants and bars including a swim up pool bar. But for those of us who enjoy a little pampering Thalasso Bali Spa is the most enticing reason for staying at Grand Mirage. 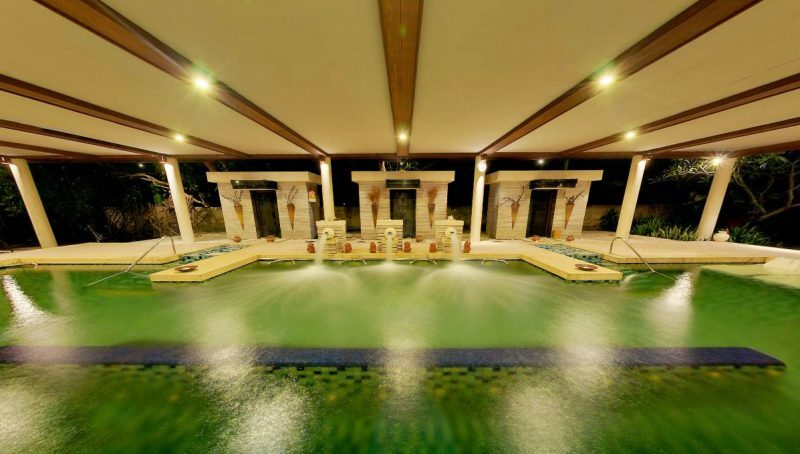 One of only two spas specialising in Thalassotherapy (the other one is Ayana Resort & Spa), which refers to treatments using marine elements of seawater, seaweed and marine clay for curative and medical treatments. Utilising the curing properties of seawater dates back to Roman times when ancient Greeks and Romans subscribed to the theory that’in the beginning life existed only in the sea’. Treatment rooms and relaxation spaces have a tranquil marine-like ambiance with lots of natural river stone floors, filmy drapes that waft gently in the breeze and loads of natural light. Seawater is piped in directly from the Indian Ocean, undergoing a filtration system to ensure the water is absolutely pure. Many treatments utilise this natural resource. A large hydrotherapy pool is filled with natural seawater and heated to 38 degrees Celsius has massage stations and an exercise. Jets of water are directed as various muscles to improve circulation and muscle tone. as guests move through the pool, stopping at each massage jet. The foot massage jets are to die for! 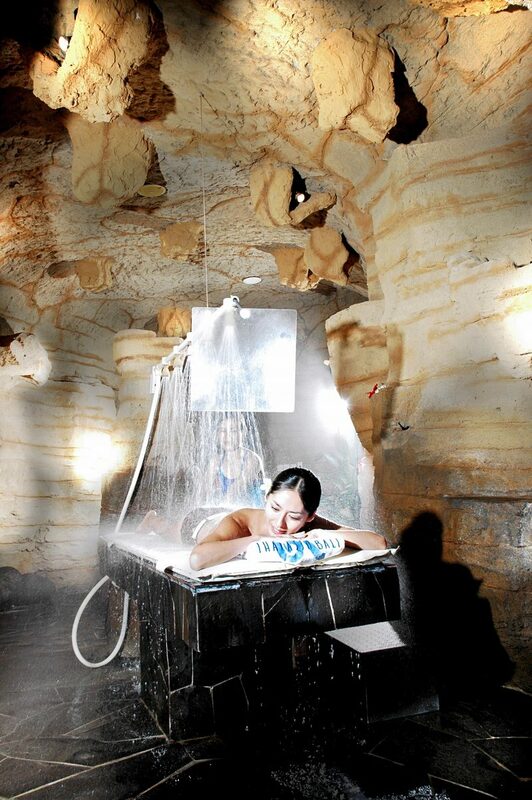 Or if you can’t be bothered moving from one water jet to the next, lay back on an underwater bed and feel your muscles relax with an effervescent massage. But for this water baby it’s hard to go past an Affusion Shower Massage. Lying on a massage table in a sort of underground cave-styled treatment room, I’m gently massaged with aromatherapy oils before the real massage begins. Heated seawater jets from an overhead system that runs the length of the table cascade strongly onto my entire body. My masseuse (who is wisely wearing bathers, while I’m kitted out in nothing more than disposable knickers) massages my oiled body at the same time. It’s an immensely pleasant experience that seems to end all too quickly. My skin is left feeling cleansed and decidedly hydrated, my muscles are loose, though my hair suffers a bad bout of ‘spa hair’. No matter, there are plenty of lotions and potions in the locker room for me to spruce myself up before leaving. A gift shop stocks alluring products utilising Thalasso therapy ingredients. Prices are very reasonable. An Affusion Shower Massage (50mins) will set you back USD68, and an hour in the Aquamedic Pool costs USD30. Couples and wedding groups are particularly well-cateref for. Extended treatment packages are well worth it if you’ve got half a day or more to spend pampering yourself. And why wouldn’t you? It’s what holidays in Bali are about after all.